Are you suffering from a terrible cold?! If so I have the perfect concoction that I make when I’m bunged up and feeling ill. Bear with me, I know it sounds a little unusual BUT I promise it actually tastes ok. 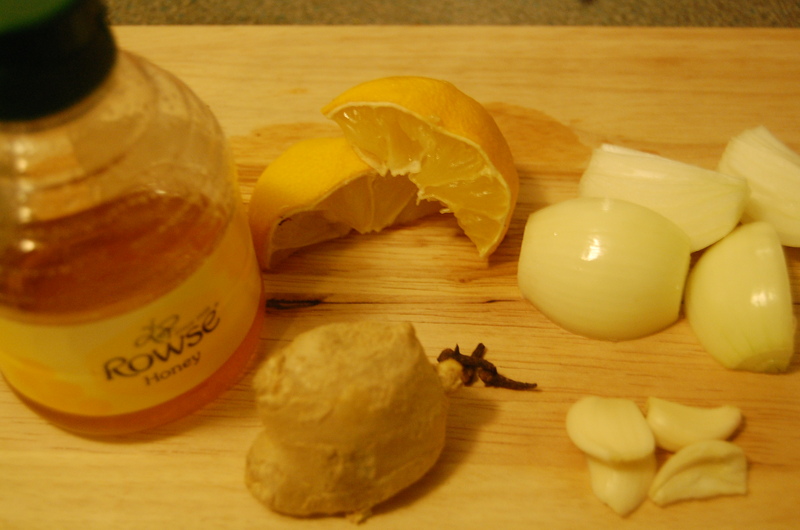 In a pan add all the ingredients except the honey and bring to a boil. 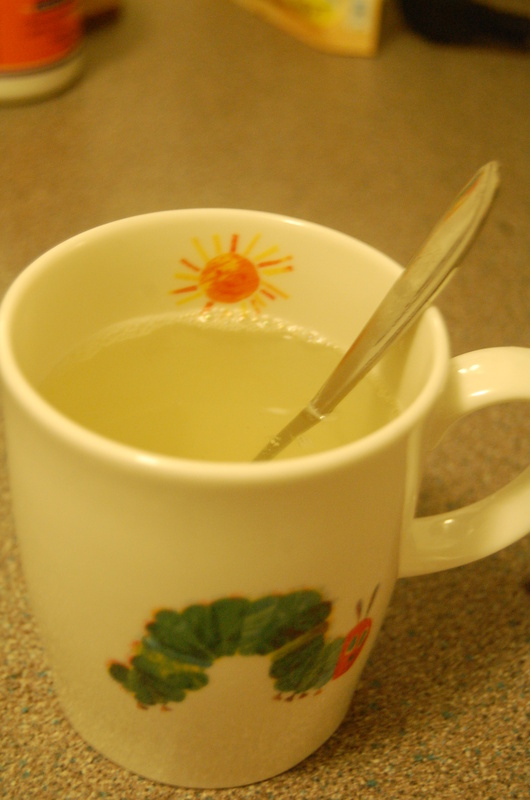 Drain the water into a mug and add the honey. Drink and hopefully you’ll feel better! Cloves have many properties some of them being antioxidant, antiseptic, local anaesthetic and anti-inflammatory (great for those sore throats). If you have a bad cough or cold an infusion of dried violets can also help as they have antifungal, anti-inflammatory, and antiseptic properties. On Friday evening I went to Greensmith’s where there’s a great butcher. They have really good meat and it’s not over-priced. I decided to get some lamb shank and on Saturday we hade a nice roast. This is usually cooked with red wine but we didn’t have any, so I improvised. This is what I love about cooking, trying out new things, not knowing if it’ll work and when it does feeling proud of my new creation. Now I’m not saying my strange mixture is better than using red wine but it sure is a cheaper version and tastes pretty good. Cut you garlic in two and make holes in the lamb and put your garlic in the holes. Do the same with some rosemary twigs (2 per lamb shank). With some string tie your herbs together – to make a bouquet garni – they will be easier to remove. I used a normal cooking pot but if you can use anything with a lid that can go in the oven. Put the pot on the hob and add the olive oil, then add the lamb and brown every side. Then add the onions until they start to brown. 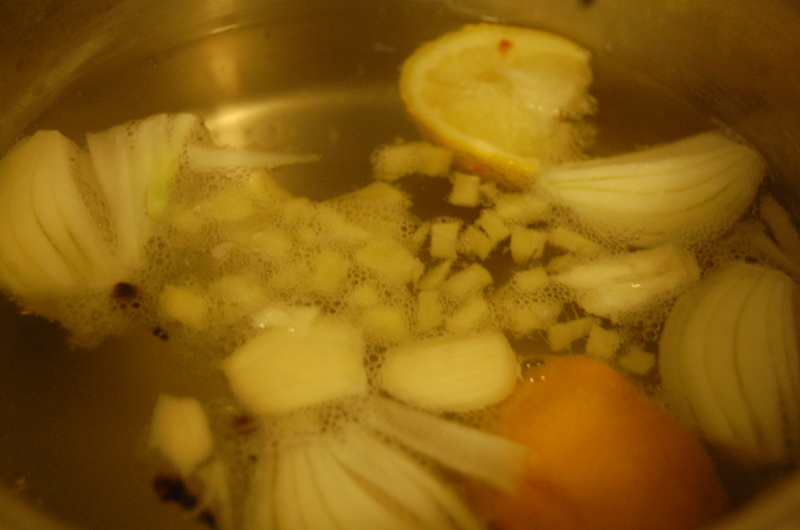 Reduce the heat and add the soy sauce, vinegar, honey, beef stock and bouquet garni. Keep on the hob until the liquid boils, making sure everything is mixed well. Remove from the hob and cover with the lid and place in the oven for 2 hours (if they are large 2h30m). Check the meat half way through. 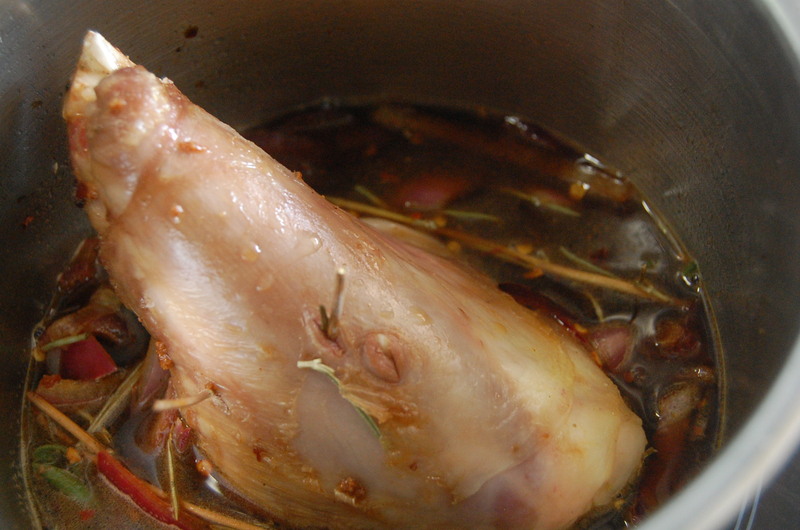 Remove your pot from the oven and remove your bouquet garni and the rosemary from the lamb. If you want your sauce to be nice and clear (a little messy) you can use a colander to drain the sauce through into a bowl, then pick out and bits of herbs then add the onions to your sauce. We had yummy cheesy mashed potatoes with this. It all went down a treat and was really easy to make. 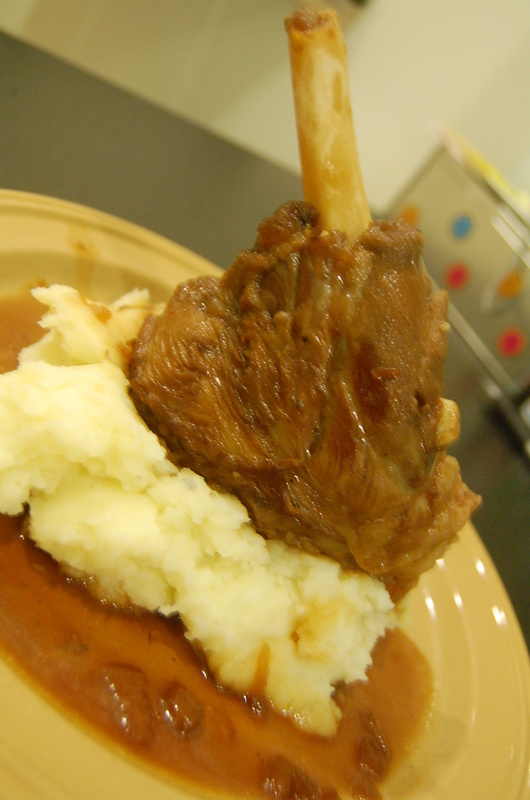 Place you lamb shank on some mashed potatoes and pour the sauce over it. Very yummy! This is one of my favourites, it’s easy to make and can never go wrong. The ingredients used sound a strange combination but for some reason it works! Pre-heat your oven to 200C. In a bowl mix all the ingredients together to make the BBQ sauce. Cut the ribs and place in an oven dish, cover the ribs with the BBQ sauce (the best way to do this is to get your hand dirty). Place in the oven for 1 to 1 and a half hours depending on the size of your ribs. You need to check on them every 20 minutes, turn them over and use the BBQ sauce in the bottom of the oven dish to cover the ribs. 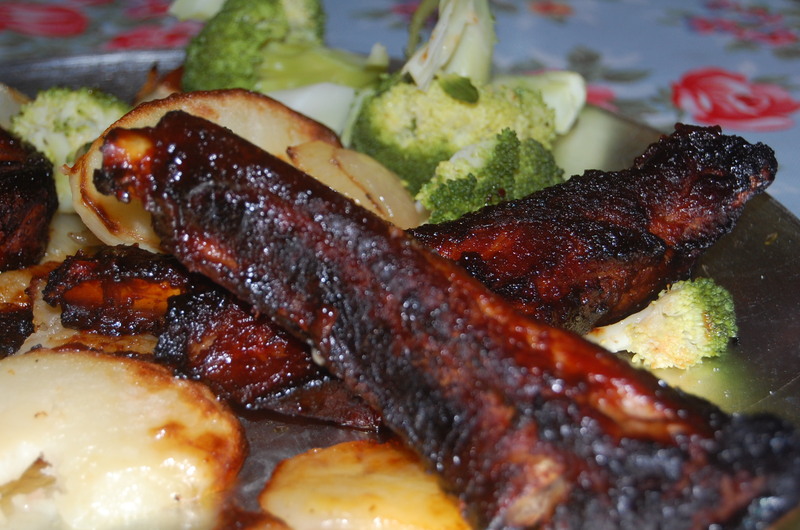 You will know that the ribs are ready when they take a dark golden colour and all the sauce is gone from the bottom of the oven dish. If you are in a hurry you can boil your ribs for 10 minutes beforehand. My husband brought home some cherries yesterday and they were SO sweet! I decided to add them to my favorite salad dressing and the result was delicious. In a blender, mix the cherries, vinegar, honey, salt and pepper. Mix until the cherries are invisible. Then slowly add your oil. I would start out with a 1/4 cup and then taste it. This is when you decide if you need more oil or honey. If you have added a 1/2 cup of oil and the vinegar taste is too strong, add more honey. At that point, if you continue to add more oil, you risk losing the cherry flavor. I put this over mixed greens, goat cheese and toasted walnuts. YUM! Most people who sit at a desk for their job acquire items in their drawer such as paper clips, pens or post it notes. I have those things too but always keep a whisk, olive oil and balsamic vinegar in my drawer. I like fresh salad dressing and I find it comes in handy. Today is a great example. For lunch my co-worker brought in chicken she cooked at home and some pita pockets. I had brought some mixed greens, a handful of olives, a small tomato, 1/2 cucumber, about a quarter cup of feta cheese and a tablespoon of red onion. We combined all of the ingredients (dicing up the cucumber and tomato), including the chicken. I whisked 2 tablespoons of balsamic vinegar with salt and pepper and slowly added 3/4 cup of olive oil. Then added a little honey. We tossed all of the ingredients in the dressing and stuffed it in the pita pockets. It was flavorful and easy to make. We wrapped our pita pockets in napkins and sat outside to enjoy the sunshine.